← This. Is. Original sin. 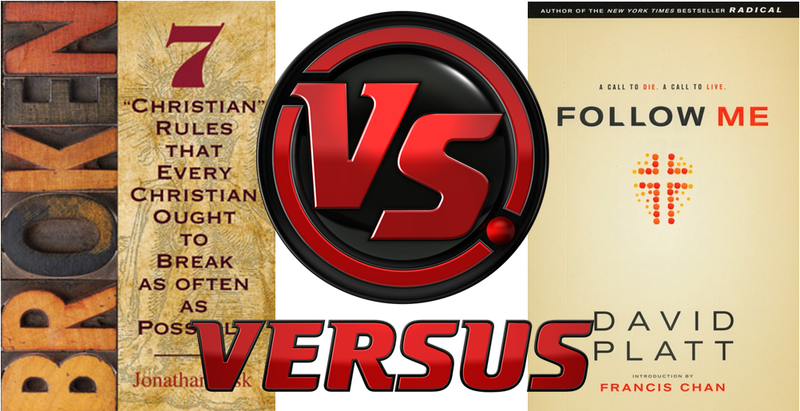 “Broken” Jonathan Fisk versus “Christ-following” David Platt – Reformation vs Rome?! I am a member of the LC-MS, the Lutheran Church – Missouri Synod. Like many confessional church bodies, we seem to divide long certain lines. Many in the LC-MS have taken to calling themselves “missional” while others have labeled themselves “confessional”. In practice, this seems to usually come down to churches that use contemporary Christian music and some “church growth” techniques and those that use the Church’s historic liturgy and generally are wary of church growth strategies. “Not all are Christians who boast of faith. Christ has shed His blood. We are justified by faith alone without works. You say, “I believe this.” The devil, you say! You have learned the words you have heard the same way mockingbirds learn to repeat things. Where are the fruits demonstrating that you truly believe? You remain in sins; you are a usurer and more. Surely Christ did not die and shed His blood for the sins that you are intent on committing continually, but so that He might destroy the works of the devil [1 John 3:8]. If you were formerly a usurer, say, like Zacchaeus: “I will give half of my goods, and if I have defrauded anyone, I will restore it fourfold.” [Luke 19:8]. The blood of Christ kills sin; it does not make it alive, which is the work of the devil, who inflames the desire that makes human beings murderers and adulterers. Christ did not die so that you might remain that kind of sinner, but so that sin, having been slain, might be blotted out, and you might henceforth love God and your neighbor. Faith takes away sins and puts them to death, so that you might not live in them but in righteousness. Therefore, show by your works and your fruits that there is faith in you. If not, the blood of Christ does not help. If you are a usurer, disobedient, neglectful of your station, then look to see whether you believe. For faith is victorious, triumphant, a conqueror of the world [1 John 5:4]. If you truly believe, you would not commit usury or adultery; you would not be disobedient. Let each one think: I have been made a believer; I have been washed in Baptism with the blood of the Son of God, so that my sins might be dead. [I will] not be disobedient and will declare this with my deeds.” Otherwise, give up the boast of being a believer. You know that you are a disobedient son, an adulterer; do not boast of faith and the blood of Christ. You belong to the devil, the way you are going, etc. You are bringing the name of the Lord into shame and yourself to eternal damnation.”— — Martin Luther, Sermon for the First Sunday after Trinity on 1 John 4:16-21, preached in St. Mary’s Church, Wittenberg, Germany June 7, 1545, Translated by Christopher Boyd Brown. Pr 2002; WA 49:80-87. Copyright Concordia Publishing House, 2011. Here one can see that Luther is showing those who have true faith are concerned that they demonstrate their faith by works – they realize faith and works go hand and hand and make their confession believable. Those who don’t have true faith don’t have this concern, even if they were at one point baptized. If my bringing baptism into this confuses you, listen to this excellent 1.5 minute clip from a powerful Lutheran preacher. Sadly, Luther and the Golden Mouth, being separated by chronology (and geography) were never able to get together for a beer and discuss these issues in their broader context. But thankfully the same limitations to not apply to Pastor Fisk and Pastor Platt. I think the idea of preaching the Law radically, and pointing out how our love for the world falls so short of Jesus Christ (see the trailer from Platt’s first book at the end of this post, which at the very least raises some very challenging points), is a superb idea that ought to be put into practice more (see John 16:8-11 here) At the same time though, I think that the more we do this the more we need to also give out God’s grace just as radically. Can we do both at the same time? I think seeing a conversation between these two men would be a great blessing for all Christians. Thanks so much for your comment. Good thoughts. I think I’d say there are good works we all should be doing all the time as well as those that are more particular to individuals. Also, as regards a Christian’s particular circumstance, there is often more than one way to “skin a cat” when it comes to the good works we do in Christian freedom. Well, ideally they get together one on one for beer (if that’s OK with Platt – I assume it is : ) ) first to get to know each other a bit and have some small talk. Then, ideally, Platt agrees to come on WE TV for an interview and they talk about this some more. That’s what I’d like to see, and I think we all agree that there are “unconverted believers” (though we’d say they actually aren’t believers at all). I think Platt probably does want to say that but it certainly does not come across in the trailer for the book. But then again, maybe he does not want to say that. I don’t know. I had previously heard Jonathan’s WE video and he points out that trading one falsehood (i.e., decisonal manipulation) for another (legalism) was no solution. We are back to James showing you are a Christian (to other Christians) = Luther. Maybe Pastor Fisk should actually read the book before creating a video response to a short video trailer. David Platt does not preach a Gospel of works in the book. Pingback: Steadfast Lutherans » Great Stuff — Is a Faulty Understanding of Sanctification at the Root of the Worship Wars? Very discouraging. My life shows no fruit, none. I try though. Ready to just give up on Christianity. I sometimes feel the same way. But I still want to be with Jesus, and that’s a good sign. To whom shall we go?